I can truly say that this book has impacted me in a way that very few books have. 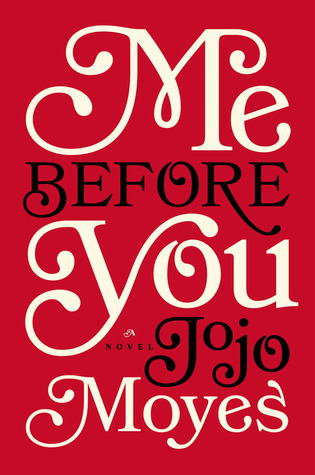 Not only does Jojo Moyes write in a style that keeps you awake and wanting more, the story she weaves in this book is simply enchanting and is somehow both a completely unique situation and yet totally relatable in other aspects of it. I don't want to say much more, because I was lucky enough to not have been spoiled by anything, for anything, and I really think the experience was amazing. So, everything else will be spoiler-y :) Warning- it's quite long. To be completely honest, I'm wasn't sure how to start this review, because in just over 350 pages, the author was able to create an incredibly full story with so many different layers and themes to it. However, I think this worked out well, going over the formatting of the book, the relationship between Will and Lou and the morality of euthanasia, my few complaints, the familial connections running through it, and then finally, the title and what I think may be one of the most important lessons that this book teaches its readers. I'm not entirely sure how I feel about the layout of the book. I don't think anyone can argue that Jojo Moyes is a brilliant writer, but at first when the POV switched, I wasn't sure if it was the best. Based on the tone of the book, I had been thinking that it might have been better to keep it with one character so that we could feel more connected to them, but this actually worked out really well because we got to see a few other perspectives. I am an absolute sucker for a good ship. ;) Of course I wanted Lou and Will to be together. They were able to connect on a level of true understanding and companionship that everything became so natural for them. I also really loved the impact that they had on each other, with Lou making Will's life so much better and him encouraging her to live hers. With this relationship though, we saw two different views on the notion of Will taking his own life. Previous to reading this, I was like Lou: I was absolutely against the idea of assisted suicide, for anybody. After reading it though, and seeing it through Will's perspective, it has made me look at those values again and think things over. I still don't have a solid opinion on the topic yet, and I don't know if I ever will again. But I do know that because of this, I was forced to think, "Who am I to determine the quality of somebody else's life?" Now, clearly, there are so many moral themes running through this, and I think that it is so hard to form an opinion on it, partially because everything is so circumstantial, especially today with all of the medical advances. I don't think the phrase "playing God" only refers to the taking of life anymore, but also the extending of it. There were two things that I was not a huge fan of. The first being that there were a few moments that reminded me of TFIOS. That in itself isn't actually a complaint against the book, just against the connections I made between them. The other one was Treena's chapter. She is a really interesting character, but I think in that part of the book that she was narrating, I would have liked to know Lou's POV instead. Lou's family is in and out of the story and a direct part of it the entire time. We see them interacting everyday and I really like how it showed the sacrifices that they were making for each other. Not every family is perfect, but they are still family, and the story did a really good job of portraying that, both in Lou's family and Will's. I especially loved the relationship between Lou and her sister because it is so realistic. Sisters are a pain, and they are constantly at each other's throats and vying for attention, but they also will always have each other's backs. They fight and argue with each other, but they also fight and argue for each other. The title was a puzzle to me for the longest time. Halfway through the book, I though it meant that the two main characters put themselves at a disadvantage first before others so that they can do whatever they can for those other people. I suppose in a way that they do, but by the end of the book I realized what the title meant. "Me Before You" is a way to point out the evolution of the two characters and the profound impact that they had on each other in such a short amount of time. In the beginning, Will was horrible and depressed, but by the end of the book, Louisa has gotten him to travel again and laugh and see some of the good around him. He dies a happier person. Before she met Will, Louisa was perfectly content living in her small village with a boyfriend that was safe(?) and ordinary. She didn't seek out any thrills or life experiences and had no major plans or goals for her life. Within those six months though, she is completely changed. Will convinces her to take advantage of her life and to truly live it to the fullest. He tells her that it was her duty to life to fill it up. I love that. These two people only know each other for a short span of time, and yet they have completely changed the other for the better. Of course, I probably missed something, or have stepped on somebody's toes, but all I can do is beg people to read the book for themselves because my head is still spinning, hence the crazy review.